LAS VEGAS - Feb. 22, 2018 - PRLog -- Veterans Village is pleased to announce that it has received a grant from Sands Cares, the corporate giving program of Las Vegas Sands Corp. These funds will be used towards the construction of 11 "Tiny Houses" to be constructed utilizing re-purposed shipping containers. 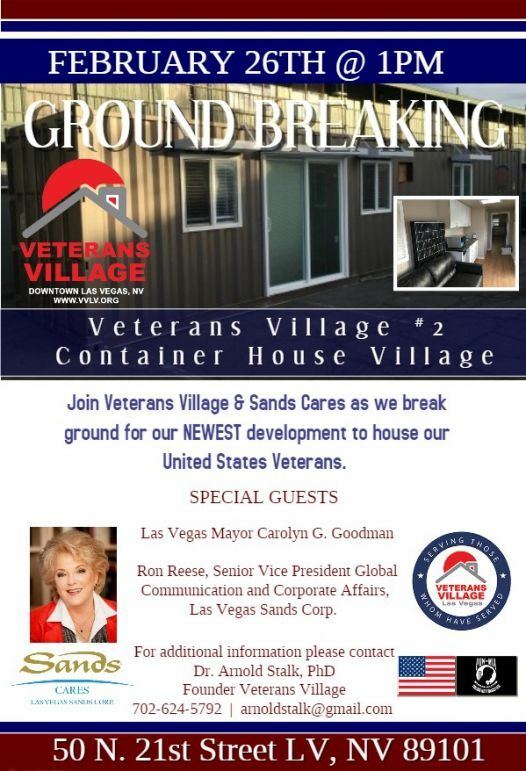 Veterans Village Las Vegas will hold a ground-breaking ceremony at the Veterans Village #2 Campus which is home to 204 units of housing along with a 24/7/365 crisis intervention center & 3 Square food pantry where the eleven (11) Veterans Village Tiny Houses will be constructed. The Veterans Village Tiny House and the expansion of housing units on the Veterans Village #2 campus is part the master plan to address the nationwide U.S. Veterans Housing Crisis. The 100% recycled housing units can be rapidly transported anywhere in the country via railroad "piggy-back" trains, semi-trucks, or jumbo air cargo transports for immediate occupancy. This project will be a national model for replication. "This fast construction is an economically sound, environmentally friendly option which aims to create a comprehensive housing solution to meet the need for affordable housing. It also stability and support for our U.S. Veterans to successfully transition back into civilian life," according to Arnold Stalk PhD, Founder. Veterans Village Las Vegas. · City of Las Vegas Mayor, Carolyn G. Goodman. · Ron Reese, Senior Vice President Global Communication and Corporate Affairs, Las Vegas Sands Corp.
Las Vegas Mayor Carolyn G. Goodman. Ron Reese, Senior Vice President Global Communication and Corporate Affairs,Las Vegas Sands Corp.